Haaretz reveals Netanyahu took part in a secret summit in Jordan in 2017, where Kerry presented plan for regional peace initiative. Haaretz revealed on Saturday that Prime Minister Binyamin Netanyahu took part in a secret summit in the Jordanian city of Aqaba a year ago, where then-U.S. Secretary of State John Kerry presented a plan for a regional peace initiative. According to the report, Kerry’s plan included recognition of Israel as a Jewish state and a renewal of talks with the Palestinian Authority (PA) with the support of the Arab countries. Netanyahu reportedly did not accept Kerry’s proposal and said he would have difficulty getting it approved by his coalition. Nevertheless, according to Haaretz, the Aqaba summit was the basis for talks that began two weeks later between Netanyahu and opposition leader Yitzhak Herzog (Zionist Union) on establishing a unity government. It was Kerry who initiated the conference after the previous peace initiative he had led collapsed in 2014, when the PA unilaterally applied to join international organizations in breach of the conditions of the talks. During a meeting with President Barack Obama in the Oval Office on November 10, 2015, Netanyahu reportedly told the President he had new ideas for renewing talks with the PA. Obama, who no longer believed that Netanyahu had serious intentions, asked him to discuss the matter with Kerry, according to the sources who spoke to Haaretz. The following day, the sources said, Netanyahu met with Kerry and proposed a series of significant gestures to the PA, including permits for massive construction by Palestinians in Area C, the area of Judea and Samaria under Israeli military and civilian control. Netanyahu asked that in exchange Washington recognize that Israel could build in the large “settlement blocs”, but did not make clear whether this meant construction outside the blocs would cease. Two weeks later, Netanyahu held two long meetings with the security cabinet in which he tried to drum up support for these steps, but a number of terror attacks at that time, along with opposition to the move by Jewish Home ministers Naftali Bennett and Ayelet Shaked, cooled Netanyahu’s enthusiasm. When Kerry came to Israel on November 24, Netanyahu informed him that the proposals he had presented just two weeks before were no longer on the table. 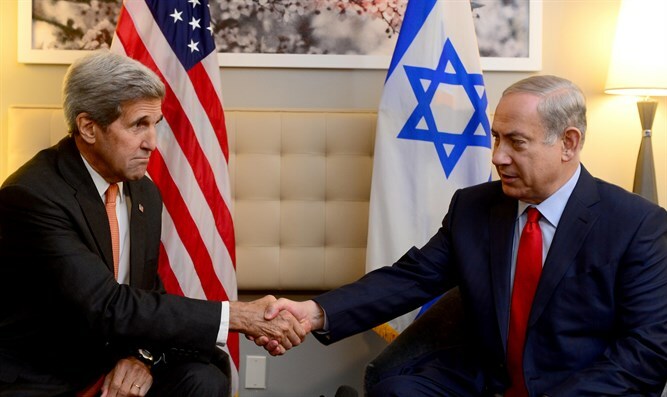 Kerry, while surprised by Netanyahu’s change of heart, did not intend to give up. * International secure and recognized borders between Israel and a sustainable and contiguous Palestinian state based on the pre-1967 borders, with agreed-on exchanges of territory. * Implementation of the vision of UN Resolution 181 (the Partition Plan) for two states for two peoples, one Jewish and one Arab – which recognize each other and give equal rights to their citizens. * A just, agreed-on, fair and realistic solution to the issue of Palestinian refugees that conforms to a solution of two states for two peoples and will not influence the basic character of Israel. * An agreed-on solution for Jerusalem as the capital of both countries, recognized by the international community and ensuring freedom of access to the holy sites in keeping with the status quo. * A response to Israel’s security needs, ensuring Israel’s ability to protect itself effectively and ensuring Palestine’s ability to give security to its citizens in a sovereign, demilitarized state. * The end of the conflict and of demands, which will allow a normalization of ties and increased regional security for all, in keeping with the vision of the Arab Peace Initiative. On January 31, 2016, reported Haaretz, Kerry met with Netanyahu in the resort town of Davos, Switzerland, and presented him with the document of principles and the regional-peace initiative along with the idea of holding the summit with King Abdullah and Sisi to discuss ways to push the process forward. The summit reportedly took place on February 21 in Aqaba. The summit would remain secret and no side would release details about it. PA chairman Mahmoud Abbas did not take part in the summit, but was aware that it took place, according to Haaretz. Before the four-way meeting, Kerry met separately with each of the leaders. A former senior U.S. official told the newspaper that Kerry asked during his meetings with Abdullah and Sisi to show support for his plan. He asked that they persuade additional Arab countries like Saudi Arabia and the United Arab Emirates to support the plan as well, and take part in a regional diplomatic move that would include a renewal of negotiations between Israel and the Palestinians. Kerry sought to have Abdullah pressure Abbas to agree to renew the talks based on the American plan, and Sisi would do the same vis-a-vis the Israeli government. The former senior U.S. official noted that both the Jordanian King and the Egyptian President agreed to express support for the plan even though it included recognition of Israel as a Jewish state. Former senior U.S. officials noted that at a meeting with Netanyahu in the context of the summit, the prime minister evaded a clear answer on the proposed plan. They said Netanyahu presented a series of reservations, arguing that the principles were too detailed and that he would have difficulty winning support for them in his coalition. During the four-party meeting, Haaretz reported, Abdullah and Sisi reacted positively to the proposal and tried to convince Netanyahu to accept it. The former senior U.S. officials said Netanyahu was hesitant. Instead of relating exclusively to Kerry’s plan, they said he presented a plan of his own at the four-party meeting, which he called his five-point plan. Through the plan, Netanyahu expressed a readiness to take the steps regarding the Palestinians in Judea, Samaria and Gaza that he had spoken with Kerry about in November 2015. He also said he would release a statement relating positively to the Arab Peace Initiative. In return, Netanyahu asked that the negotiations with the PA be resumed and that a regional peace summit be convened that would include attendance by senior representatives from Saudi Arabia, the United Arab Emirates and other Sunni Muslim countries. The leaders returned to their capitals agreeing to consider the various proposals, according to the newspaper, but the secret summit in Aqaba had an almost immediate effect on domestic Israeli politics, as it provided the basis on which two or three weeks later Netanyahu and Herzog discussed a national unity government. Netanyahu reportedly briefed Herzog on the summit in Aqaba. Herzog, who was skeptical, tried to clarify whether there was anything to it and spoke by phone with Kerry, Abdullah and Sisi on the details. Herzog refused to confirm that the phone calls took place, or to provide details of any kind on the subject. Coalition talks between Herzog and Netanyahu ultimately failed and Netanyahu decided to abandon the talks with Herzog in favor of having Yisrael Beytenu join the government, along with the appointment of the party’s leader, Avigdor Liberman, as defense minister. Herzog later hinted that his party would reconsider joining the coalition if Netanyahu ousted the Jewish Home from the government, but last November declared he would no longer be holding any talks with Netanyahu about the possibility of a unity government. The Prime Minister’s Office refused to comment on the Haaretz report regarding Kerry’s plan and the Aqaba summit.